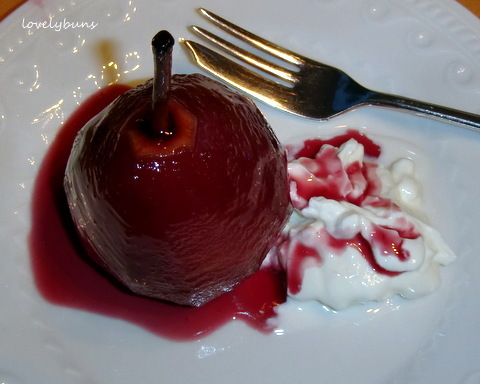 This is a quick fruity dessert, pretty light (recipe says 110 cals) and nice after a heavy meal. Very easy, minimum fuss and beautiful looking! How to : Simmer grape juice, sugar, cinnamon and cloves in a pan until the sugar has dissolved. Meanwhile peel the pears, leaving the stalk intact. 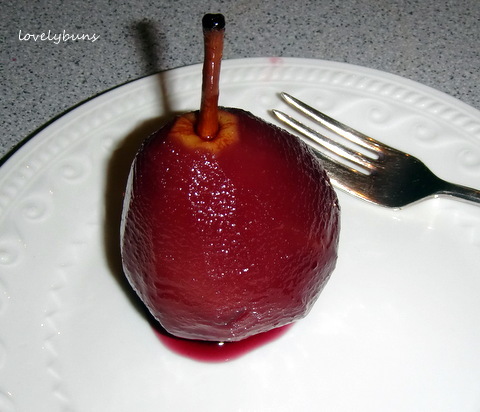 Place the pears in the liquid and simmer until the pears are soft enough to slip off a fork when poked into them – could take 30 mins if the pears are hard and only 15 if they are soft to begin with. If the pears are ready but the sauce is still liquidy, remove the pears and simmer the liquid (uncovered) until it’s thicker and syrupy. 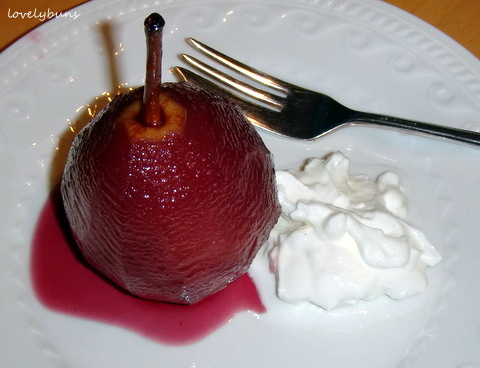 The pears could be poached in advance and then the syrup heated up at the last-minute before serving. Put 1 pear on each plate, pour some syrup over the top and serve warm with a spoonful of natural or greek yoghurt, crème fraîche or vanilla ice-cream. It’s worth making 6 each time just so you can have one for lunch the next day! I will try this recipe! Nice idea! I hope you do, it’s so delicious. I just had the last one on top of my museli for breakfast!